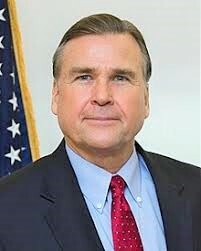 (News Investigators) /The United States ambassador to Nigeria, William Stuart Symington, says injustice and disregard for rule of law is worse than the stealing of public funds. Mr. Symington spoke on Monday at the convocation lecture of the University of Ilorin, Kwara state, where he delivered a lecture on “Citizen Leadership and the Link between Economic Diversity and Democratic Good Governance”. “What many consider as the great corruption is stealing of money but what to me is the great corruption is when people are deprived justice, when you do things without regard to the rule of law,” Mr. Symington said. Speaking on the security crisis in Nigeria, Mr. Symington said it is the responsibility of both the government and citizens to secure the country. He said there is no clime in the world where the police alone can ensure safety, while urging Nigerians to support the security operatives. “There is no police force in the whole world that keep the neighbourhood safe all by itself. If you have such a police force, I would not want to live in that neighbourhood. Every security in the world derives from the support of the people in the place that is insecure. In August, President Muhammadu Buhari was severely criticised for saying his administration would not sacrifice issues of national security for the rule of law.